Hello everyone! 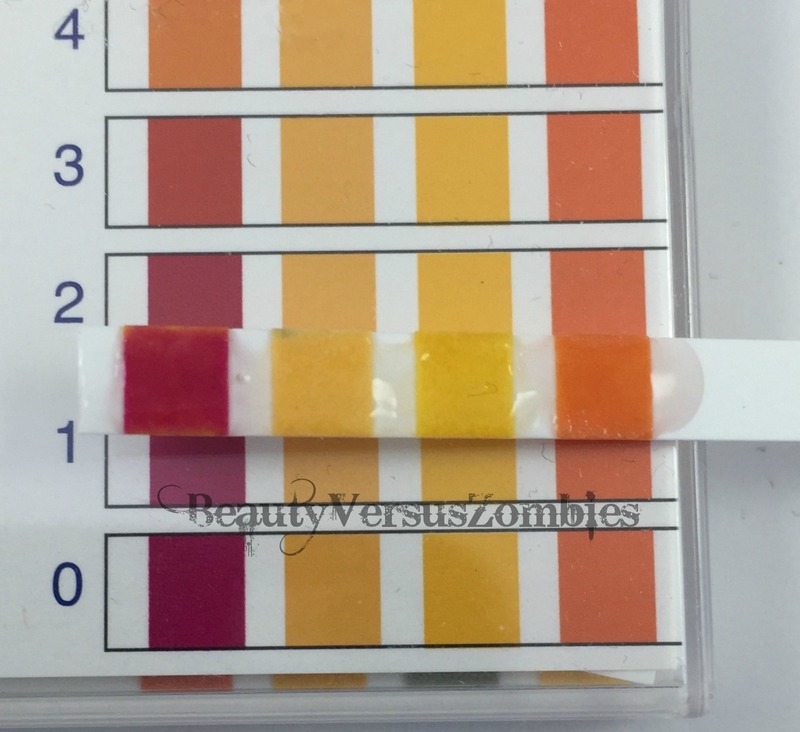 It’s been a while since I’ve been able to commit enough time to this blog, thanks to a busy time at work, a seriously nasty respiratory virus, a skin crisis, and just general hectic-ness. So I’m starting off small. Here are my first impressions of the October Play by Sephora box. I’ve been not so good about doing first impressions for the other Play by Sephora boxes, and frankly it’s because I haven’t really been wowed by them. I was actually considering ending my subscription after the last box. I’m glad now that I didn’t, because I’m super excited by this month’s box and that makes me hopeful for boxes in the future. So without further ado, let’s take a look at this month’s box! One of the things I really like about this product is the wand – it has the same modified doe-foot shape that I really liked in the Etude House Color In Liquid Lips that I reviewed a while ago. It has a sharper tip, so it’s easier to do precision coloring. I’ll put a swatch below, along with one of the next product, so you can get a sense of the color. 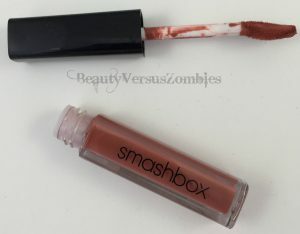 In terms of wear, this is a regular liquid lipstick. That means it’s a bit thicker and heavier than a regular lipstick. It’s not as bad as it could be (I’m looking at you, Clio Lipnicure), and it’s not uncomfortable, but you will definitely notice that it is there. It’s really easy to apply and goes on with no tugging. Unfortunately, after about 45 minutes, it started to look kind of cakey on my lips. I find that look really unpleasant, and I could tell that the lipstick was about to start flaking. That’s enough for me to be done with this product, really. I’m all for multi-use products; anything that can simplify my life is probably worth trying at least, right? So this lip and cheek pencil definitely qualifies there. This is labeled as non-drying and is supposed to wear for up to 6 hours. This particular product is fairly neutral, which is nice. It’s a good color for my skintone. It sits fairly lightly on the lips, isn’t overly heavy, and isn’t particularly drying either. It’s easy to apply and doesn’t drag on the skin, which is helpful if you plan to use it as a blush product. It will not, however, last through a meal. I drank some water while wearing this, and afterwards some product came off when I pressed my lips to my hand. Overall, I like this stick, and I’ll keep trying it, but I think that the promised wear time is optimistic at best, given the fact that I can’t go six hours without a sip of water. 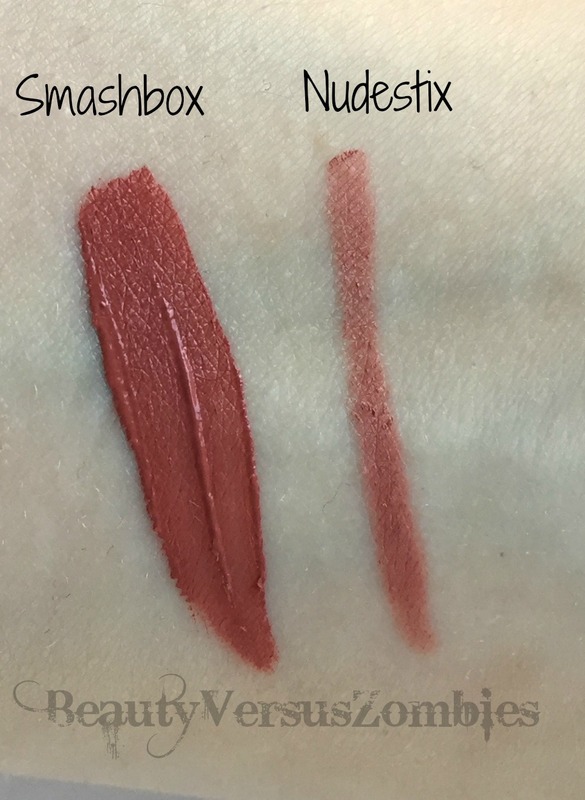 The Smashbox liquid lipstick is darker than the Nudestix by far. YAY! Too Cool for School! Not only is this a k-beauty product included in the Play by Sephora box, which entertains me, but I’ve been wanting to try their brand for a while and have been too lazy and haven’t had the money lying around to invest in a whole bunch of new products. I’m so pumped that this is in here! The product itself is actually a little pump jar, which is super cute. The cream itself is basically the same color and texture as Clinique’s Dramatically Different Moisturizing Lotion, if that’s something you’re familiar with. Not too shabby! The cream itself isn’t overly scented and doesn’t leave a greasy residue, which is good. The Play by Sephora pamphlet tells me that this can be used as a serum, priming moisturizer, eye cream, neck cream, and sleeping mask. I personally look for something a bit thicker as a sleeping pack, and I use everything that’s in my skincare routine on my neck. In the bit of trying that I’ve done by putting this on my hands, it’s done a decent job moisturizing (but not good enough for seriously dehydrated skin). I think that if you want significant priming you’re better off going for an actual primer, but if you want just a hint of priming this could do okay. Usually when I see hair products in the Play by Sephora boxes I just go “Bleh.” This really wasn’t an exception until I read a little more about it: this leave-in mist is designed to moisturize, detangle, smooth, and protect your hair from heat styling. Generally I don’t need help detangling my hair, and my scalp is oily as all get-out so moisturizing products tend to just make it worse. However, now that I’m rocking a (much) shorter haircut, I’m noticing that I’m getting more flyaways, so I thought I’d give this a quick run and see how it performed. It kind of foamed when I sprayed it onto my hand, which is a little creepy. I don’t need foam in my hair. In fact, I actively avoid putting foam in my hair. But whatever, I’ll be a guinea pig. So I showered and applied it to my towel-dried hair. This means I applied it to hair that was semi-damp. I don’t know if that’s right. I don’t particularly like the feel of the product – it was kind of sticky. But my hair did feel pretty soft when it dried. I decided to go bananas testing this against flyaways, which meant taking a nap with it still in my hair. (Life is rough sometimes.) Although my hair stayed soft, and the spray didn’t weigh my hair down at all, my cowlicks stayed cowlicky and I still had some flyaway hair. I guess I’ll have to settle for looking fashionably mussed. 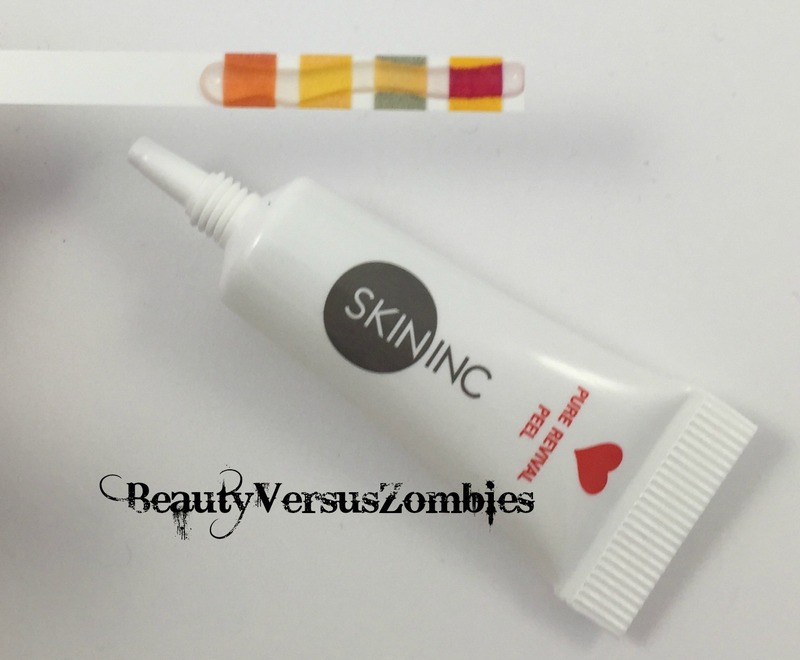 I was happy to see something from Skin Inc. in the October Box. Skin Inc. is a Japanese brand whose products are all fragrance free. This is a skin peel containing AC-11, which is derived from the cat’s claw plant. It is supposed to get rid of dead skin cells. 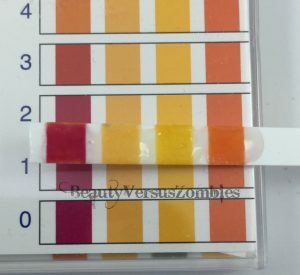 Again with my compulsive pH testing. 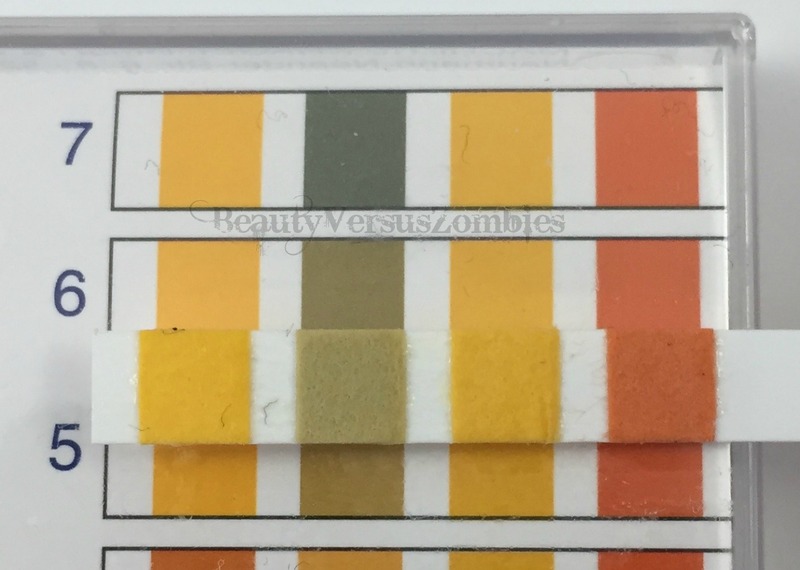 You didn’t really need to see that picture but I liked the visual of the line of product on the pH strip so I included it. Don’t judge my artistic vision. This product comes in a tiny tube with an even tinier nozzle, so you don’t have to worry about accidentally squeezing out too much product. I hope the full size is similar. My face is really freaking out based on the change in seasons. It’s too sensitive to do a test with something like this, but I’m pumped to use it later. I’m not going to write much about this. You all know my feelings about perfume samples in boxes. I do think it’s nice that they include high-end perfume in the box. The only thing about the perfume itself that I will note is that it contains vetiver, which I absolutely hate. It would be a no-go for me even if I didn’t work in a fragrance-free office. Overall, I think this was a pretty strong box! Obviously I’m uninterested in the perfume, but everything else was fun. That even includes the hair product. Although I didn’t love either of the lip products, I was glad for the chance to try them out. A J-beauty mini and a K-beauty mini both piqued my interest. I consider this box to be $10 very well spent. 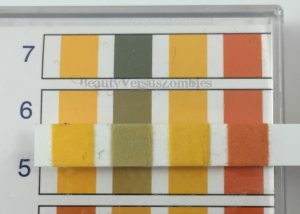 This entry was posted in first impression, minireview, Sephora, subscription box and tagged first impression, makeup, Play by Sephora, skincare, unboxing by BeautyVersusZombies. Bookmark the permalink. Next → Next post: Final Fantasy XV – Worst Road Trip.